Well it’s been a while since our last little chinwag, so a here’s a nice firm, but unsettlingly lengthy handshake to those of you left that care from your long lost pals THE SCARAMANGA SIX. We come bearing news of a gaggle of rock concerts coming up in the next few months for no specific reason other than we can. I suppose we’re still promoting the latest behemoth of an album, ‘Chronica’, which you can expect to hear an unhealthy selection of tunes from at these shows, as well as a smattering of the classix (with an ‘x’) just for you, the kidz (with a ‘z’). We’ll keep this briefer than the usual epic tomes. Basically, our gargantuan double-album ‘CHRONICA’ has finally lumbered into its final resting place as a fully-released album. Many of you will already have experienced the ‘Joy of Six’ through your appreciated contributions towards our PledgeMusic campaign, now closed – hopefully you will have all by now received any physical products but please let us know if you are missing anything. For those of you who didn’t pledge, this is now your opportunity to get your hands on either the CD, double heavyweight vinyl or digital versions of this colossal album. With distribution through Shellshock, the album is available in all the usual places – Amazon, iTunes, Spotify etc. Finally, just to say that we feel the same pride as any new parent when we unleash new creative offspring on the world, and with Chronica we couldn’t be more proud of the new twins. We trust you will take them both into your hearts. Some very important announcements follow, so take all the heed you possibly can then take some more in case you run short of heed over the coming winter months. Featuring on side 1, album 2 of ‘Chronica’, this song depicts the horrible aftermath of a flash of rage amid a domestic scene. The character in the song is a man with a lit fuse, unable to deal with the red mist that descends at any provocation. In a previous life of service, his lack of self-discipline earned the court marshal and an early discharge. Nobody likes a loose cannon. Described by a punter at one of our recent gigs as a ‘demonic cross between Sparks and Chas ‘n’ Dave’, this piano-led song has started to become a regular feature of our intense live performances. As that comparison would hint towards, the arrangement alternates between seething staccato stomp and bouncing joy with more than just a nod to The Spiders from Mars. Recorded in the Chronica sessions, but unable to be jammed anywhere into either parts of the album, this is another piano-based opus with The Scaramanga Six’s almost trademark elaborate overture section at the beginning. The song eventually settles into a pseudo-latin-gypsy-whatthehell? groove with a first-person narrative sung from the point-of-view of a brow-beaten doormat assessing his own self-pity before galloping off on an esoteric chorus that bears no relation to the song, let alone reason. Please do your best to share both this video and the BandCamp link for the single on your preferred social media platform – we reply on YOUR support and recommendation, which is always greatly appreciated by this jaded old band. Go to our shop page to put in a pre-order direct with us RIGHT NOW. All just in time for your early Xmas shopping spree! 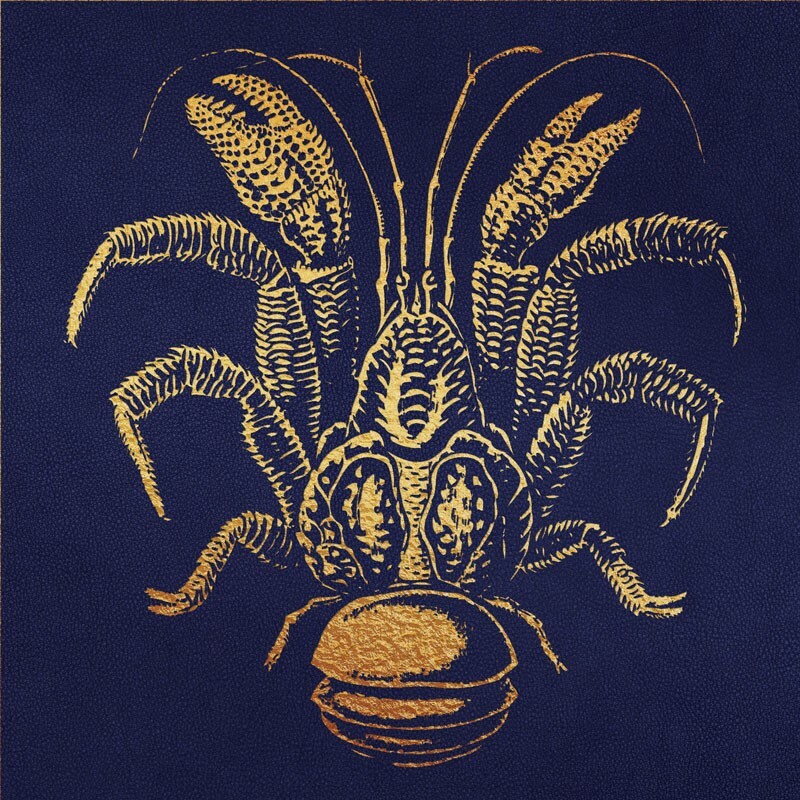 We’ll also be making the super-special heavyweight double-vinyl with gatefold sleeve available from our own shop at www.thescaramangasix.co.uk with a possible shops release coming in the new year. You’ve had the blurb many times already about the concept of ‘Chronica’. 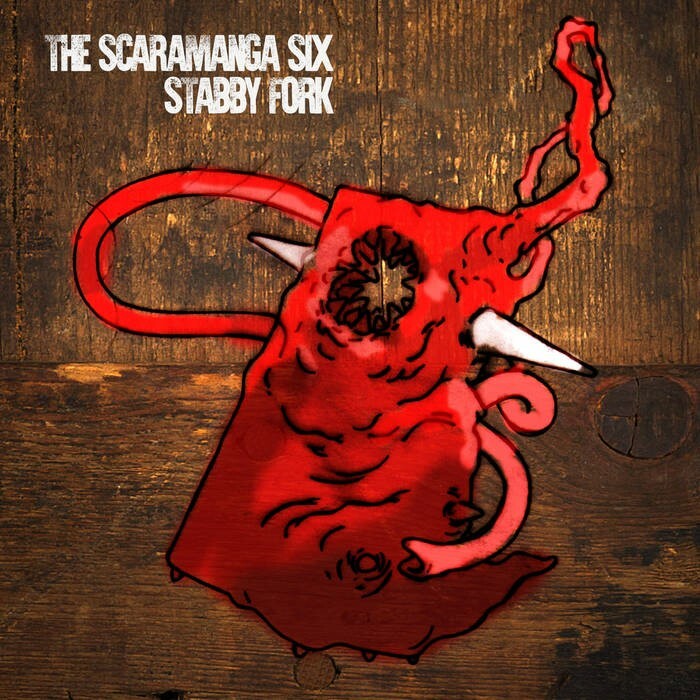 Rest assured that this is the most thorough, intense and well-executed album to date by The Scaramanga Six. Truly an album that you will be able to inhabit, who’s twists, turns and secrets will be revealed with every further listen. To say that we are proud of this record would be understating things to the power of infinity. We’ve been filled with pride at the conception and often difficult births of all our aural offspring over the years, and I know you’re not supposed to have favourites, but we feel this time we’ve delivered a set of twins who’s magnificence eclipses all our previous works. 22 tracks of wilful weirdness over an hour and a half will take you on a bewildering rampage across the Chronic Isle. A thing of beauty both inside and out. 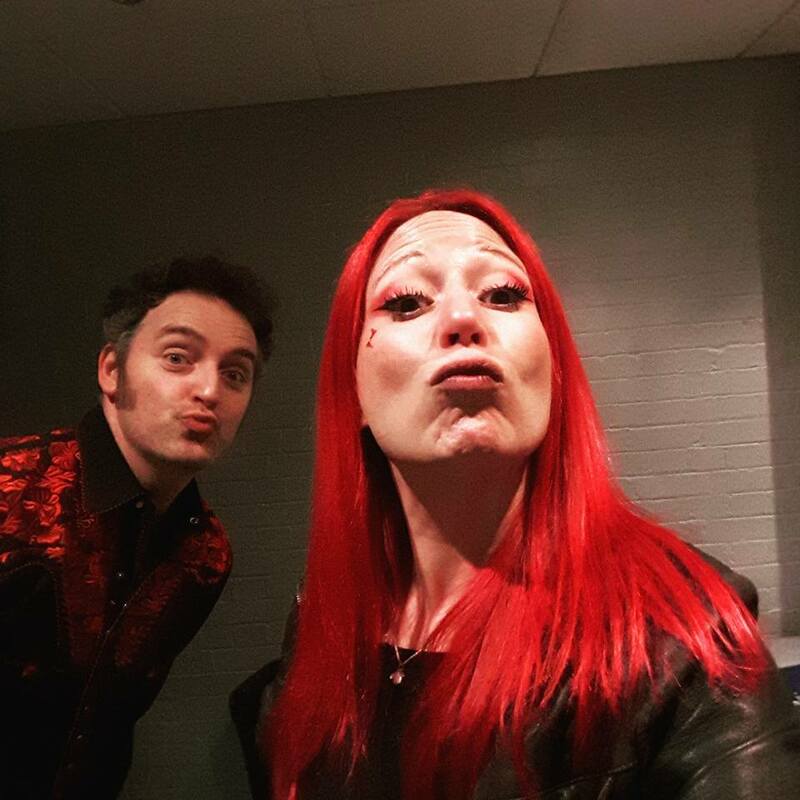 Finally, we can let you know that in the coming weeks we shall be looking to honour all the wonderful Pledges made by the few hundred lovely people that showed their support and faith in us through the PledgeMusic campaign. The funds raised have enabled us to manufacture the album on CD and vinyl to a specification we know you’ll cherish + also take care of the myriad of extra items. Over the coming weeks, you lovely Pledgers will start to receive bundles of joy sent straight to your door. Please bear with us as we work through the massive list. And of course, feel free to shout about your spoils all over the interweb. So here we are again. It appears we, THE SCARAMANGA SIX, have emerged from our murky hideout once more, our many busy appendages pumped full, old casings cracked and shaken away, hardened and hungry with abdomens bloated ready to burst forth. Over the past year and a half, our irrepressible group has been back in Sheffield with engineer extraordinaire, Lord Alan Smyth (we did ‘Cursed’ and ‘The Terrifying Dream’ with him) galvanising a new arsenal of intense material that will come to form this, our 9th studio album. So much has been accrued of sufficient quality that we’ve finally taken the inevitable step of committing to a double-album. The title of this work is ‘CHRONICA’ – containing an abstract story roughly hewn from a concept of a dystopian island society. A place where everything has fallen into ruin, yet people still seem to have the same preoccupation with the trivial crap they had before. The population trudge through a chaotic existence on top of each other with absolutely no hope of a better life. Society is reduced to its base behaviour yet people still crave superficial fixes. The human condition carries on regardless. There is no outcome, no lessons to be learned. Familiar? This is our second foray into release through this magnificent PledgeMusic platform, following the hugely successful ‘The Terrifying Dream’ album/EPs/DVD campaign in 2015 which completely funded the manufacturing, post-production and promotion of the album. 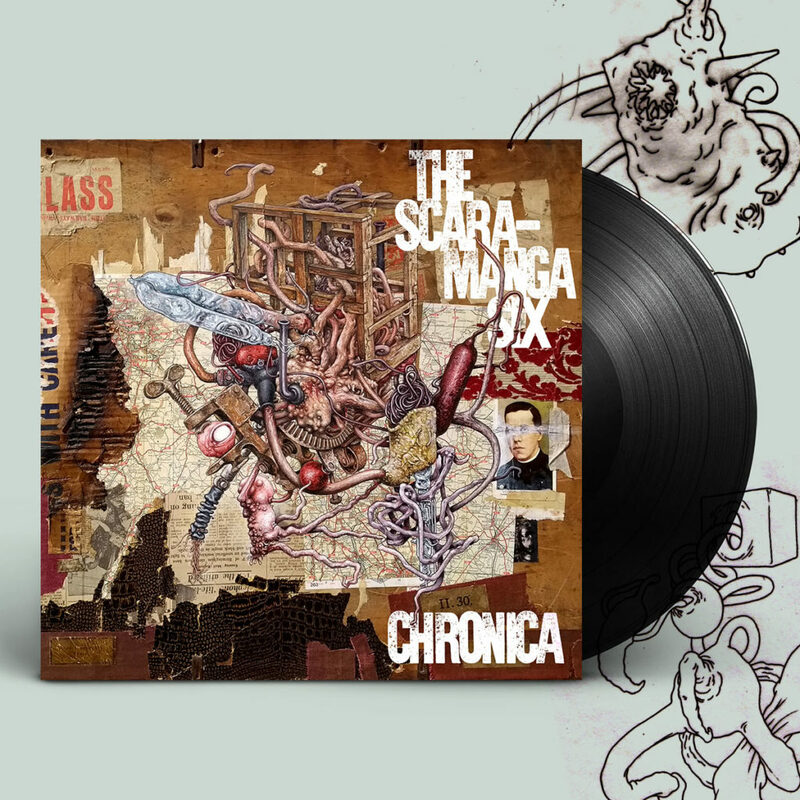 Flushed with cockiness, we have decided to up the ante this time round – we’re offering Chronica not only on digital download and CD formats, but for the first time ever we’re going to do a plush gatefold double heavy vinyl version, which as you all know doesn’t come cheap. There will be various bargainous bundle offerings, new apparel, unfathomable merchandising opportunities and personalised items of both affable and abusive natures. Along the way, we’ll also fling whatever secret crap we can find that will stick, all completely exclusive to those who pledge. Once again we thank you for your patronage, and happy hunting for the second time. 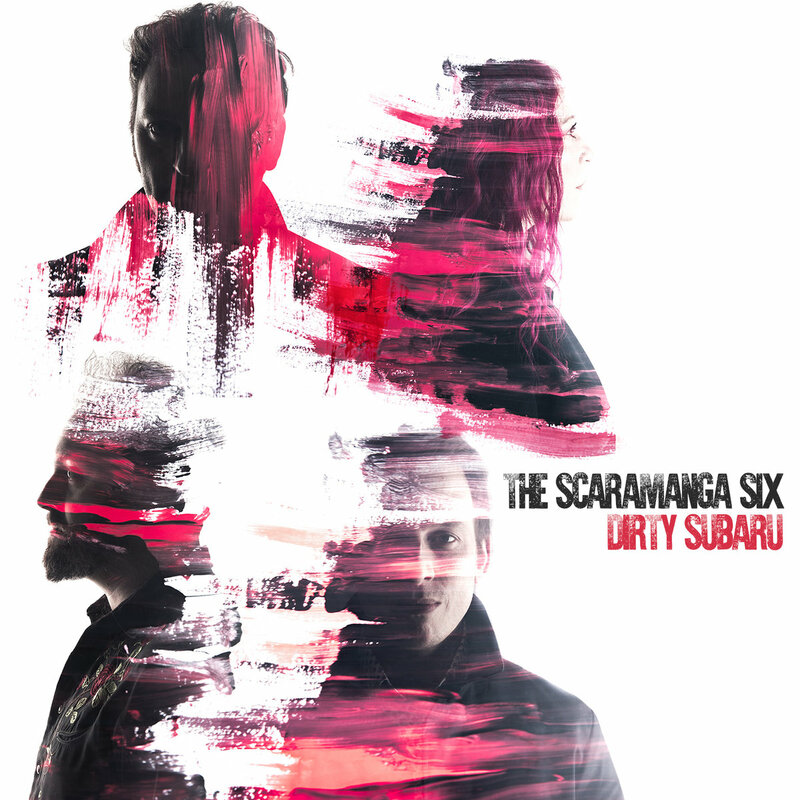 New Single – ‘DIRTY SUBARU’. Out NOW! ‘DIRTY SUBARU’ / ‘A CAR’ – Two motoring-related tracks from a land where beaten up racers clog the car parks and lay-bys. Loud and to the point, The Scaramanga Six are in urgent form. Buckle up – we’re gonna do a fast one! So it appears THE SCARAMANGA SIX have emerged from their murky hideout once more, their many busy appendages pumped full, old casings cracked and shaken away, hardened and hungry with abdomens bloated ready to burst forth. Over the past 14 months, the irrepressible group have been back to Lord Alan Smyth’s studio in Sheffield galvanising a new arsenal of material that will come to form their 9th studio album. So much has been accrued of sufficient quality that they have finally taken the inevitable step of planning a double-album. The title of this work will be ‘CHRONICA’ – containing an abstract story roughly hewn from a concept of a dystopian island society. A place where everything has fallen into ruin, yet people still seem to have the same preoccupation with the trivial crap they had before. The population trudge through a chaotic existence on top of each other with absolutely no hope of a better life. Society is reduced to its base behaviour yet people still crave superficial fixes. The human condition carries on regardless. There is no outcome, no lessons to be learned. 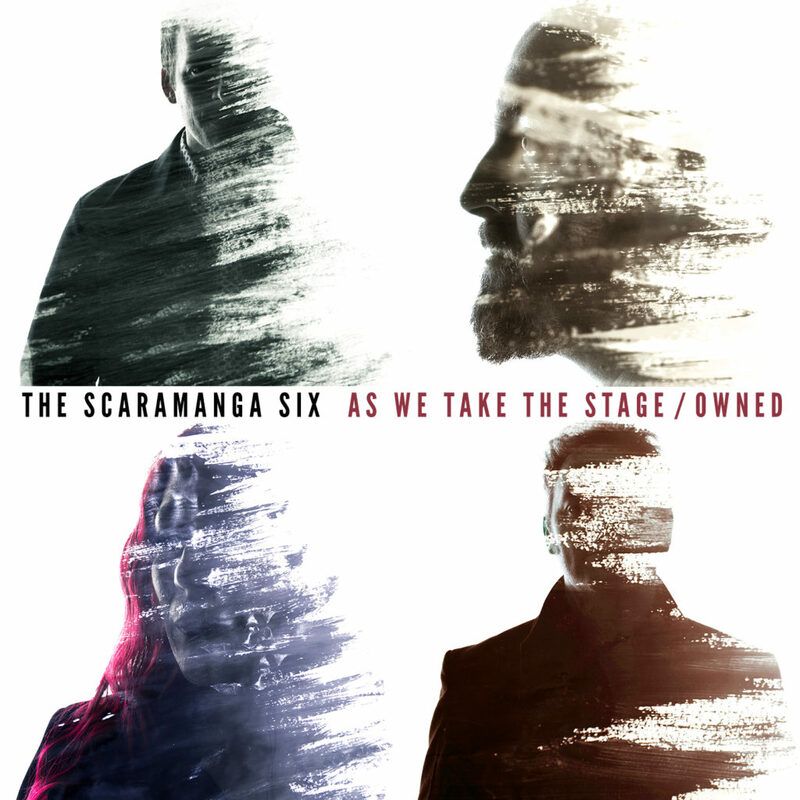 The Scaramanga Six aim to release this monster in the summer of 2017 on heavyweight double vinyl as well as the usual digital formats via the medium of the PledgeMusic platform that worked so well for their previous album, ‘The Terrifying Dream’. There will be a trove of other pledge-based exclusives made available, some generous and some personalised and abusive. Watch this space for more information about this soon. For now though, you are offered a pair of epic & expansive tracks from Chronica as a stopgap/taster of things to come. This single release will be entirely digital, and you are asked to pay what you want for the tracks – even if that be nothing. All that The Scaramanga Six ask is that you digest, enjoy and share. The core quartet of Morricone/Morricone/Arnez/Champion are bolstered by long-term collaborator, Stephen ‘Evens’ Gilchrist to return to the double-drum assault last heard on the ‘Phantom Head’ album. The distant pounding comes to the fore and the band launch afloat a gargantuan vessel towards the shores of the Chronic Isle full of the foolhardy self-confidence that has chequered their careers. They can’t stop and they won’t stop. This mantra is repeated belligerently as a barrage of drums build and build. Those of you who have attended any of the band’s recent rock rituals may have heard an intense and brutal version of this epic new song, which seems to be a strange dichotomy of internal fury and overt sloganeering. It has undoubtedly been well received, with startled gig-goers finding themselves joining in involuntarily after just the first howl of the chorus. This studio recording kicks off with an almost teutonic overture featuring the mighty Wasp synthesizer. The scene is set – it’s a retrospective vision of a potential future, all tinfoil and tablets. What follows are three movements of increasing velocity and ferocity. 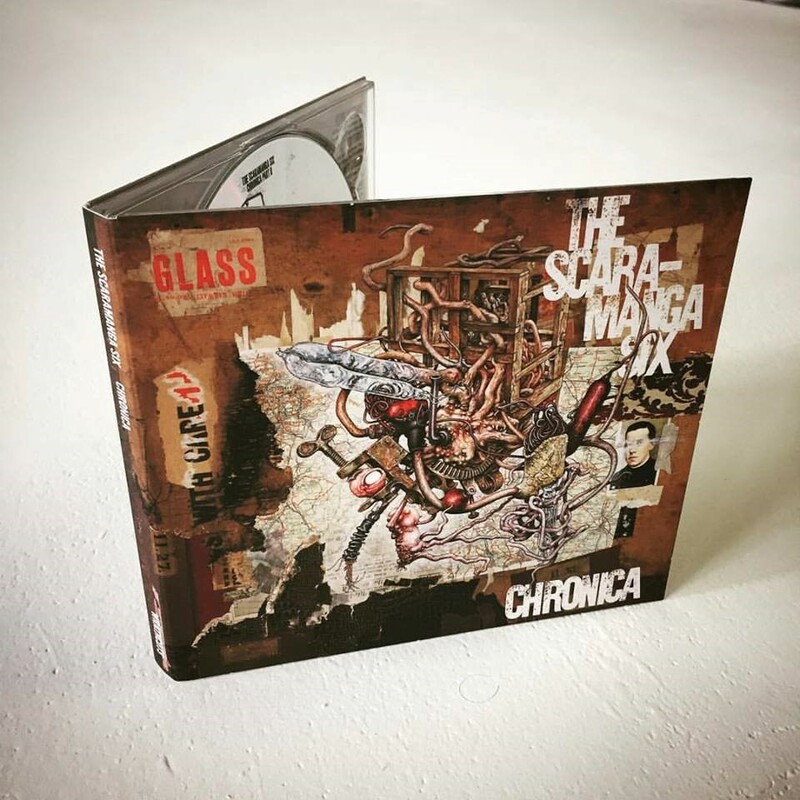 A picture of Chronica emerges as the lyrical content jumps back and forth in time to reveal the cyclic nature of decay – ‘This is not the end’. Musically, the band explores a tapestry of bleak post-punk, krautrock and bludgeoning melodrama. 2016 has been a typically busy year so far for The Six. Having a slight break from live appearances might have lulled people into false sense of insecurity. But we have been hard at work in the background and are already half-way through recording our next long-player. Since December 2015 we have been sporadically beavering away at recordings once again with Lord Alan Smyth at the helm in his Sheffield studio. We currently have the bones of 18 new tracks down and there will be more. More news on how and when we plan to release this monstrosity will follow later in the year. In the mean time, take a look at the appearances page as we have just announced a sprinkling of live shows throughout the rest of the year. In the mean time…pucker up fools! Feb 2016 News – Pure Rawk Awards etc. Apologies for the radio silence from THE SCARAMANGA SIX over the last few months – we have been busy fattening up for winter and raising new broods. 2015 has come and gone, and was a hugely enjoyable year for our musical assault group: The rampant success of our first ever PledgeMusic campaign led to the release of our 8th studio album ‘The Terrifying Dream’ plus a trio of EPs containing a plethora of new material, a DVD release compiling our music videos and documentary of our Chicago trip a couple of years previously and a set of triumphant live engagements helped to carve our musical initials into many new eardrums. 2016 is getting off to a flying start – much news to impart, so here goes…. There are of course plenty of other great bands nominated and you may also want to vote for Eureka Machines, Tropical Contact, Mr. Shiraz and The Idol Dead amongst others – they are all winners. Feat. THE SCARAMANGA SIX, ROLE MODELS, THE IDOL DEAD + many more to be announced. Take a trip to our shop by clicking here and you can buy the album, as well as the three EPs (each with three exclusive tracks), a tote bag, and our stylish new Batface shirt in not one, not two, not four but THREE colours. We think you will agree, as you fumble for your credit card, that there is something for absolutely everyone. Happy shopping!